I remember my Grandmother Bessie Reed [Hill] Pearce (1887-1974) as short and pleasantly rotund, as was her mother, Alice Virginia [Moon] Hill. Her sisters were Myra, Hazel, and Mary “Mayme.” They were all usually in attendance at the occasional Hill Reunions when I was a child. Grandma Pearce lived by herself the last years of her life in a second floor apartment on Elm Street, Butler, PA, the county seat. After her husband Wesley died in 1955, the farm near Mars [see “The Move to Mars: The Later life of Wesley Herron Pearce”] was sold and she agreed to be relocated halfway between sons Ralph, who lived near Cooperstown to the south, and Dale, who lived in Grove City to the north. As was the custom in those days, Mom and Dad would manage to visit both sets of their parents each Sunday after church. We siblings grumbled from the back seat of the car, but after a few of Grandma’s delicious home-made vanilla sugar cookies and maybe some cousins to play with, we forgot all about being bored. Her hair had turned naturally white by that time, but on occasion the extra artificial coloring made it appear blue. She always wore an old-fashioned dress with black shoes, the thick, low-heeled geriatric type, and never went anywhere without her dress hat and large purse, not unlike Queen Elizabeth. There’s some irony in that analogy, as we shall see. She loved reading, but she also thrived on company. One of the things I regret in my life is that I didn’t have an interest in family history then to want to sit and talk with Grandma about her life and memories. Fortunately, between my late farther Ralph, his cousins, and her nieces and nephews, I’ve been able to put together some of the pieces for this article. The name “Bessie” is the familiar version of Elizabeth, first known in the Bible as Mary’s cousin and the mother of John the Baptist. From the Hebrew Elisheba, the name means “God is my oath.” This was the name of her great-grandmother, but we can’t be certain that her parents named her for Joseph Marshall’s wife. Bessie’s future daughter-in-law, my mother Ruth Gray Pearce, had Elizabeth as a middle name. Ironically, the familiar Bessie was quite popular in the 1920s and 30s, with performers like jazz singer Bessie Smith and George Gershwin’s operatic characters like Porgy and Bess. My mother says that she and Grandma always got along very well, but I doubt that Grandma ever appreciated African American culture in her lifetime. We are still researching Grandma’s middle name, but we believe that it came from the marriage of her great-aunt Anna Martha Marshall to the Rev. Alvin McClure Reed in 1864. He was a Presbyterian minister from Greenville, Mercer County, who served parishes throughout Western Pennsylvania. He was originally from Columbiana County, Ohio, the son of Matthew and Martha Reed. Grandma Bessie wasn’t rich or famous; she was a hard-working, loving wife of my Grandfather Wesley and mother to four boys, including my late father Ralph [see the links to the four-part series “The sons of Wesley & Bessie” below]. She was raised on a farm in Northern Allegheny County, the oldest of six children of Joseph Marshall Hill and Alice Virginia [Moon ] Hill, and married at age 23 to a man who was 11 years older than she. His family’s farm was literally “just over the hill” (no pun intended). The Pearce’s Pine Creek settlement was no more than five miles away –go south on Babcock Boulevard and turn right on Pearce Mill Road. No doubt the Hills had their grain processed at Pearce’s mill, but we don’t know exactly how Wesley and Bessie met. We know they went to different churches. The Hills were Presbyterians, early members of Cross Roads Presbyterian, along the Wexford-Gibsonia Road (Rt. 910) where Wesley and Bessie are now buried. Wesley’s parents were charter members of Salem Methodist Church, which until 1924 was just a few miles west of Cross Roads. But, in a small farming community, there were surely some opportunities for socializing. The couple moved into the big farm and mill house after they married in 1910. Wesley’s aging parents went to live with his sister and remained there until their deaths in 1914. Wesley and Bessie ran the farming portion of the Pearce family businesses and had four boys: Walter Earl (1911-97), Howard (1914-90), Ralph Hill (1917-2002), and Dale Nelson (1918-81). 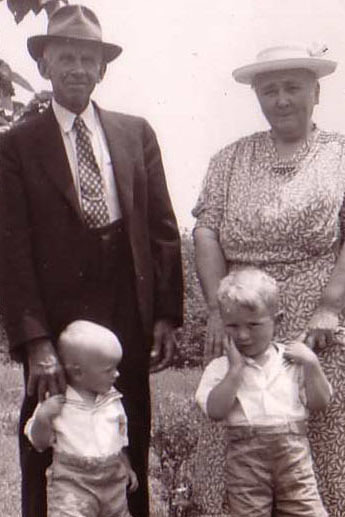 My father described his early home life as full of family but with lots of work to do – always lots of brothers and cousins around, but also lots of chores. This persisted until the County purchased the complex by right of eminent domain in 1927. That was the beginning of the construction of North Park, Pittsburgh [see “The Settlement at Pine Creek” series]. The couple, married 17 years with four boys, then bought a farm just over the Allegheny-Butler County line and started over. Wesley farmed until his death in 1955. Bessie raised the children and tended the garden and house until the boys each left home for work and marriage: Walter for the coal mine and steel mill; Howard for self-employment in the chicken-raising and egg business and eventually California and Florida; Ralph for the new local telephone company; and Dale for World War II then college and teaching. As we said, Grandma Bessie sold the farm after Grandpap died in 1955. He was a worn out 79; she was an active 68, but their sons all had good jobs and families of their own. None wanted to move back and assume the responsibilities of maintaining the farm. She really had no other choice but to move into the apartment in Butler after. She made new friends and kept the old, most of whom were her relatives. She loved to clip short articles about them from the local newspaper and mail them to the relatives along with a personal letter. She always had her writing pad on the arm of her chair. And, oh, I remember how she complained about the morals of Hollywood, which she followed on TV. What would she say if she were alive today? Perhaps my fondest memories of Grandma involved Christmas. My dad would make the long drive to Butler to pick her up and bring her back to our house, even after we moved to the West Hills of Pittsburgh. That was before the opening of Interstate 79. He’d help her out of the car, up the sidewalk, and in the door. She’d have her winter coat over the old-fashioned dress. I can still see the rugged geriatric shoes and dress hat. But the best part came after Dad helped her take off her coat and hat. She’d open that enormous purse, reach in, and hand each of us kids a fresh, new one dollar bill in a “Merry Christmas” envelope. It wasn’t much, even then, but the cards each had our names handwritten on them, so we knew that she had thought of each of us and planned this occasion well in advance. My grandmother died in 1974, just a few years after I married and started my family. Yes, the annual Pearce Reunion continued until the early 80s, but my children never really got to know her and the rest of that extended family, so it seemed like her death signaled the end of an era. Did any of our parents and grandparents try to tell us of our rich genealogical heritage in those days, or were we just not listening? I can still see Grandma Bessie sitting in her Butler apartment living room with her bluish hair, attired in an old-fashioned dress and sturdy black shoes, a book on her lap, but I miss her for her kindness, her wisdom, and her experience. If only I’d taken the time while she was alive to ask questions, then just listen.